Mr. Guzmán was denied a request that would have allowed him to hug his wife, Emma Coronel Aispuro, prior to the start of the trial. Even as the Mexican police jet started its descent into Long Island, Joaquín Guzmán Loera had no idea where he was going. All he knew was that hours earlier, he had been whisked from a prison in Ciudad Juárez and put aboard the plane. But as an airport glimmered on the ground outside his window, Mr. Guzmán — shackled, handcuffed and in the care of two American law enforcement agents — anxiously asked where he was being was taken, according to a person briefed on the trip. One of the Americans answered him in Spanish. “Bienvenido á New York,” he said. 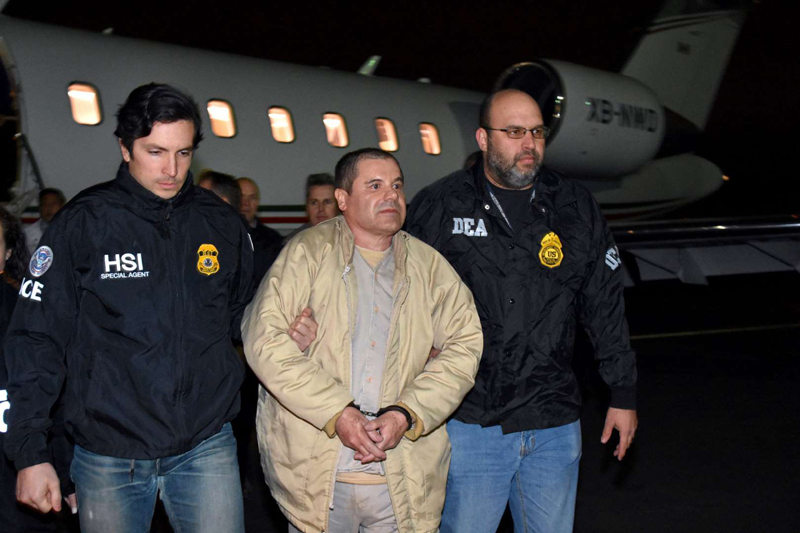 It was nearly two years ago that Mr. Guzmán, the infamous drug lord known as El Chapo, was extradited from Mexico and flown across the border, ending one of the century’s most notorious criminal careers. As the longtime leader of the Sinaloa drug cartel, he wore many guises: the savvy smuggler who packed cocaine in cans of jalapeños, the brutal killer said to have shot up a Puerto Vallarta nightclub and the folklore hero who twice escaped from prison. But this week, after decades of eluding officials in his homeland, where he was convicted in 1993 on drug and homicide charges, the legendary kingpin will finally go on trial in a United States court. At the trial, which is scheduled to start Tuesday in Federal District Court in Brooklyn, the government will attempt to portray Mr. Guzmán as an underworld executive whose sprawling empire routinely trafficked tons of heroin, cocaine and marijuana across four continents in an ever-changing fleet of trucks, planes, fishing boats and submarines. The building in Brooklyn Heights where the trial will be held is regularly swept by bomb-sniffing dogs and patrolled by a heavily-armed task force. With evidence that includes drug ledgers, satellite photos and secretly recorded audiotapes, prosecutors plan to argue that during his more than 20 years in business, Mr. Guzmán, now 59, raked in $14 billion in illicit profits, a fortune he protected with a vast payroll of corrupt officials and an army of professional assassins. The trial will be a watershed moment in America’s war on drugs and in the fraught relationship between the United States and Mexico. Leaders of cartels in Mexico have enormous resources to bribe, and terrorize, local law enforcement. (Mr. Guzmán, using bribes, previously escaped from prison in 2001 and 2015.) His extradition after his arrest in Mexico in early 2016 required almost a year of hard-fought appeals. But the trial in New York, which prosecutors say could last up to four months, will be more than a mere legal battle: It will allow the government to tell the epic tale of Mr. Guzmán’s remarkable life story. Numerous rivals, allies and underlings, along with cartel experts and law enforcement officers, are expected to recount how Mr. Guzmán rose from a poor teenage laborer who got his start in crime by farming marijuana in rural Sinaloa to become the Al Capone of the international drug trade who Forbes magazine once placed on its annual list of billionaires. It is a testament to the scope of Mr. Guzmán’s operation that before his extradition he was already under indictment in six separate federal judicial districts, among them San Diego, Miami, Chicago and El Paso. This trial will be held in Brooklyn on the orders of Loretta Lynch, the former United States attorney general who also once served as Brooklyn’s top federal prosecutor. The Brooklyn indictment, originally filed in 2009, stems from a series of obscure contract killings that occurred in New York in the early 1990s, according to three current and former law enforcement officials. Federal agents investigating the contract killings tied them a Colombian trafficker from the Norte Valle drug cartel: Juan Carlos Ramírez Abadía, known as Chupeta, Spanish slang for Lollipop. Despite altering his face with plastic surgery, Mr. Ramírez was arrested in Brazil in 2007 (in the company of his bodybuilder lover) and was sent to Brooklyn where his case was handled by some of the same prosecutors who will be trying Mr. Guzmán. Mr. Ramírez later became a government informant, helping the authorities prosecute Alfredo Beltrán-Leyva, one of Mr. Guzmán’s closest allies. Mr. Ramírez may also appear as a witness at the Guzmán trial. Indeed, as part of their case, prosecutors are expected to present a thumbnail history of the Latin American drug trade and will show how Mr. Guzmán worked hand in hand with the Colombian cartels throughout the 1990s. But within a decade, the government has said, the Colombians abandoned their American distribution routes as the country passed new extradition laws that put traffickers at risk for prosecution in the United States. Mr. Guzmán stepped into the vacuum, prosecutors say, creating routes in places like New York, New Jersey, Illinois and Texas, even as he expanded into India and China. With profits at “staggering levels,” court papers say, he became a hardened crime lord, willing to protect his turf with ruthless torture and bloodshed. But he also cultivated an image as a modern-day Robin Hood, a mythic bandit extolled in ballads called narcocorridos and became known for carrying a diamond-encrusted pistol and an AK-47 plated in gold. He was also known, perhaps most famously, for his jailbreaks and escapes. In 2001, assisted by the warden, Mr. Guzmán broke free of the Puente Grande prison, possibly hidden in a laundry cart, according to some accounts. More than a decade later, after his recapture, he escaped from the Altiplano prison — this time, on a motorcycle his associates left for him in a mile-long tunnel they had dug into the shower of his cell. After one of the most extensive manhunts ever undertaken by the Mexican government, Mr. Guzmán was captured again in January 2016, following a trudge through the sewers in the Sinaloan town of Los Mochis. He had recently evaded several other raids by Mexican authorities, including a close brush after he was interviewed by the American actor Sean Penn. Joaquín Guzmán Loera, the Mexican drug lord known as El Chapo, arriving at Long Island MacArthur Airport in January 2017. Opening statements in his trial will start on Tuesday. Given his Houdini-like talents, authorities in New York immediately placed Mr. Guzmán in 10 South, the maximum security wing of Manhattan’s federal jail. There, he spent more than 20 months incommunicado and locked in a cell for 23 hours a day. But alternate — and secret — arrangements have been made for the trial, largely because the ordeal of escorting him in a police-led motorcade across the East River to the courthouse would have required an only-in-New York traffic nightmare: the twice-daily closure of the Brooklyn Bridge. Security has been similarly tight at the courthouse. The building in Brooklyn Heights is regularly swept by bomb-sniffing dogs and patrolled by a heavily-armed task force of United States marshals, local court officers and a tactical team from the New York Police Department’s Emergency Services Unit. The jurors — five men and seven women — will remain anonymous and will be driven by guards to and from the trial each day. The prosecution has gone to extraordinary lengths to safeguard witnesses who are scheduled to testify, refusing to name them in advance of the trial and keeping them under round-the-clock protection. But public documents have provided some clues as to who might take the stand. 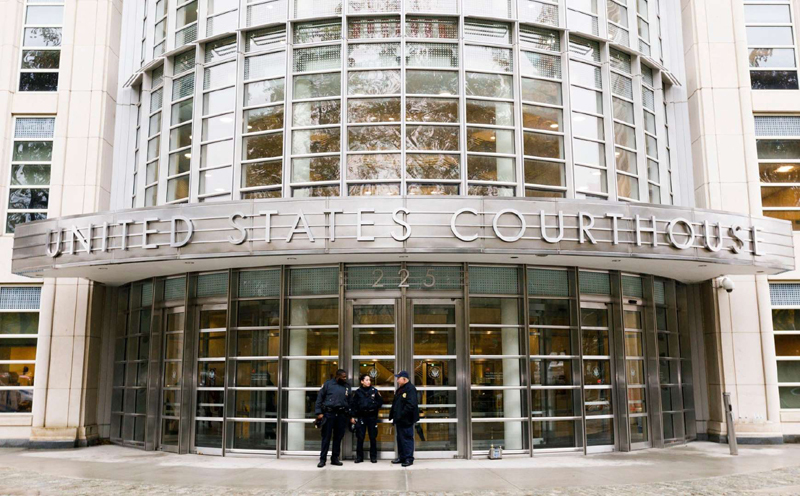 The potential witnesses include Mr. Ramírez; Vicente Zambada-Niebla, a son of Mr. Guzmán’s longtime deputy; Pedro and Margarito Flores, brothers from Chicago who have previously testified that they served as his American distributors; and Damaso Lopez Nuñez, the warden from the Puente Grande prison who helped him escape. Attacking the credibility of these witnesses will likely be a central thrust of the defense, which will be handled by three experienced lawyers. The lead lawyer, A. Eduardo Balarezo, is a cartel specialist who once represented Mr. Beltrán-Leyva. Mr. Balarezo is joined by Jeffrey Lichtman, who is perhaps best known for keeping the Mafia scion, John Gotti, Jr., out of prison. Rounding out the team is William Purpura, who once worked for the Baltimore drug kingpin Richard Anthony Wilford. Almost from the start, the legal team has protested that Mr. Guzmán’s conditions of confinement, and the Matterhorn of evidence provided by the government through discovery have deprived him of the possibility of a fair trial. In the last few weeks alone, prosecutors have handed the defense 14,000 new pages of documents — many of them in Spanish. The documents are said to offer details on some of the 33 murders that Mr. Guzmán is accused of committing. But even though the lawyers have complained at length, Mr. Guzmán has scarcely said a word at pretrial hearings. His typical demeanor in the courtroom is a loose, vacant gaze and an almost medicated silence, which seem at odds with his vicious reputation. His only public statement came in March when he wrote a letter to Judge Brian M. Cogan that opened with the magisterial line: “I, Joaquín Guzmán Loera, want to explain to you the problems that I have regarding my case.” Mr. Guzmán told the judge that he had not seen his wife — the former beauty queen Emma Coronel Aispuro — in more than a year. He also noted that he missed his twin daughters, who were six at the time. In September, the daughters, Emali and Maria Joaquína, celebrated their seventh birthdays with a lavish Barbie-themed party (carnival rides, gold chandeliers, scores of pink balloons). Photos of the party became an instant social media sensation. And last week, apparently still missing his family, Mr. Guzmán had his lawyers file a motion to Judge Cogan asking, as a “humanitarian gesture,” that he be allowed to embrace his wife in court before the beginning of the trial. In the end, the motion was denied.